We’d love your help. Let us know what’s wrong with this preview of Nestor Makhno - Anarchy's Cossack by Alexandre Skirda. Available for the first time in English, here’s the gripping story of Ukrainian anarchist Nestor Makhno. With his usual wit and engaging style, Skirda chronicles the life of a legend and the insurgent army that fought in his name. Always controversial, Makhno has been described as everything from a drunken bandit to an inspirational hero. From Makhno’s imprisonment, to bat Available for the first time in English, here’s the gripping story of Ukrainian anarchist Nestor Makhno. With his usual wit and engaging style, Skirda chronicles the life of a legend and the insurgent army that fought in his name. Always controversial, Makhno has been described as everything from a drunken bandit to an inspirational hero. From Makhno’s imprisonment, to battles with the Bolsheviks and the White Army, to the final exile in Paris, Skirda captures the life of Makhno and the history of the Makhnovist movement. 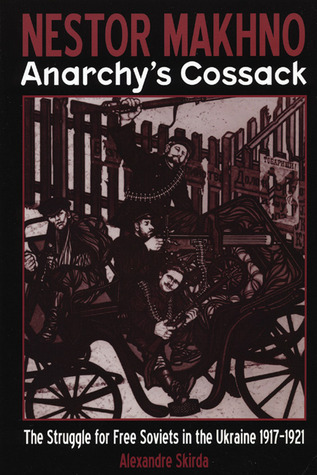 To ask other readers questions about Nestor Makhno - Anarchy's Cossack, please sign up. This book had a tendency to glorify Makhno in ways that bordered on hagiographical. For example, Alexandre Skirda (author) notes multiple times the conflicting perspectives and sources for Makhno's personal use of alcoholism and self-discipline, then seems to just give the Batko the benefit of the doubt. Another example is in the fact that he cites Emma Goldman's "My Disillusionment..." to discuss Goldman's interaction with Galina Kuzmenko (Makhno's partner) to show another source who admired Ku This book had a tendency to glorify Makhno in ways that bordered on hagiographical. For example, Alexandre Skirda (author) notes multiple times the conflicting perspectives and sources for Makhno's personal use of alcoholism and self-discipline, then seems to just give the Batko the benefit of the doubt. Another example is in the fact that he cites Emma Goldman's "My Disillusionment..." to discuss Goldman's interaction with Galina Kuzmenko (Makhno's partner) to show another source who admired Kuzmenko (304). This is part of a larger picture Skirda is trying to draw of Makhno, but he never mentions that the punch of the actual writing in Goldman's account is that Kuzmenko claims Makhno is a traditional, semi-chauvinistic man, who treats Kuzmenko like a Ukrainian peasant husband; he beats her when he is angry. Skirda completely omits this from his book, while citing its source in its same paragraph. I can't help but call historical dishonesty. This was a rather informative account of the Makhnovtsy's rebellion in Ukraine against both Whites and Reds following the 1917 October coup. I might have preferred a greater focus on the Makhnovoshchina's 'libertarian communist' approach to non-military social issues, as I walked away with more knowledge about their military efforts... Not that I think that's misplaced, considering how menaced their experiment was by both Whites and supposedly revolutionary Reds. UPDATE: Re-reading this was excel This was a rather informative account of the Makhnovtsy's rebellion in Ukraine against both Whites and Reds following the 1917 October coup. I might have preferred a greater focus on the Makhnovoshchina's 'libertarian communist' approach to non-military social issues, as I walked away with more knowledge about their military efforts... Not that I think that's misplaced, considering how menaced their experiment was by both Whites and supposedly revolutionary Reds. Utterly dripping if a tad hagiographical. Alexandre Skirda was born in 1942. His mother was Ukrainian and his father was Russian. He is a historian and a translator, specializing in the Russian anarchist revolutionary movement. His writing is in French.